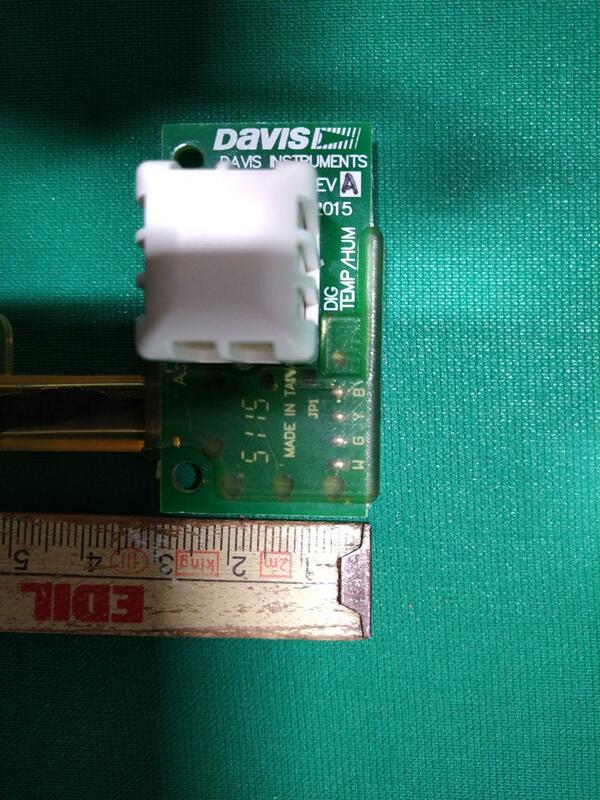 QUESTION: How to mount a Davis temperature humidity sensor inside a MeteoShield Professional? Davis weather station with a helical MeteoShield Professional installed on the right and connected to the davis wireless console. The old Vantage Pro, before 2016 uses a Sensirion SHT11 sensor, the new version use the SHT31-LSS, in any case the sensor is not the one that we can buy online but a specific version for Davis. The Davis PCB (green) where the sensor is installed is large and will fit into the MeteoShield Pro only vertically and only if the cable strain relief is removed and the cable is bent to follow the long side of the PCB and out the bottom of the MeteoShield Pro. It's also possible to cut the Strain Relief on the original cable to be able to pass it through the screen plates. After this, you can attach a new connector, which is not a big problem but some users will want to make this step or will be scared. The length of the original sensor cable is also very short, about 50 cm (20 inches), so it may require an extension. A big thank you goes out to the Italian and USA amateur meteorological community with special thanks to Mauro Serenello who was kind enough to provide us with instructions and pictures for this post.